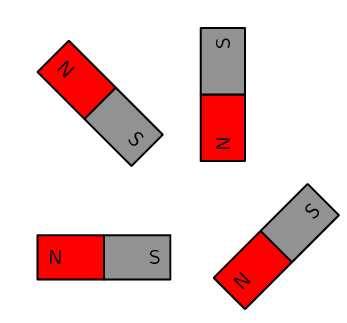 Because the domains in a permanent magnet all line up in a particular direction, the magnet has a pair of opposite poles, called north (usually shortened to N) and south (usually shortened to S). Even if the magnet is cut into tiny pieces, each piece will still have both a N and a S pole. These magnetic poles always occur in pairs. In nature, we never find a north magnetic pole or south magnetic pole on its own. In nature, positive and negative electric charges can be found on their own, but you never find just a north magnetic pole or south magnetic pole on its own. On the very small scale, zooming in to the size of atoms, magnetic fields are caused by moving charges (i.e. the negatively charged electrons). 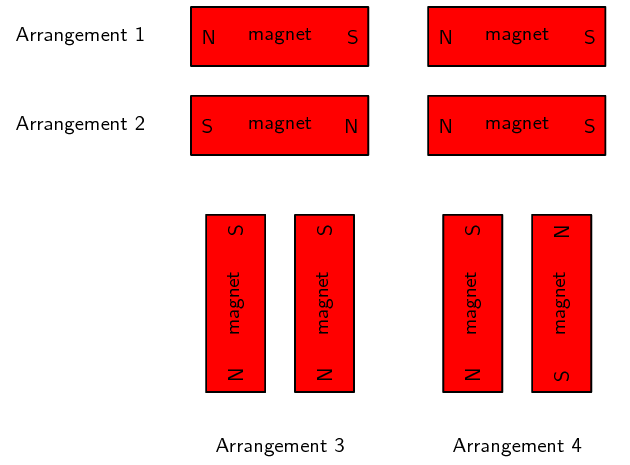 Like (identical) poles of magnets repel one another whilst unlike (opposite) poles attract. This means that two N poles or two S poles will push away from each other while a N pole and a S pole will be drawn towards each other. Do you think the following magnets will repel or be attracted to each other? We are given two magnets with the N pole of one approaching the N pole of the other. Since both poles are the same, the magnets will repel each other. We are given two magnets with the N pole of one approaching the S pole of the other. Since both poles are the different, the magnets will be attracted to each other. 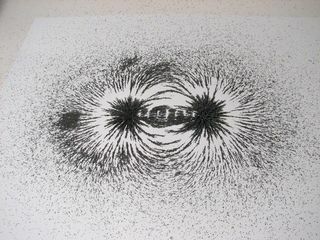 Magnetic fields can be represented using magnetic field lines starting at the North pole and ending at the South pole. 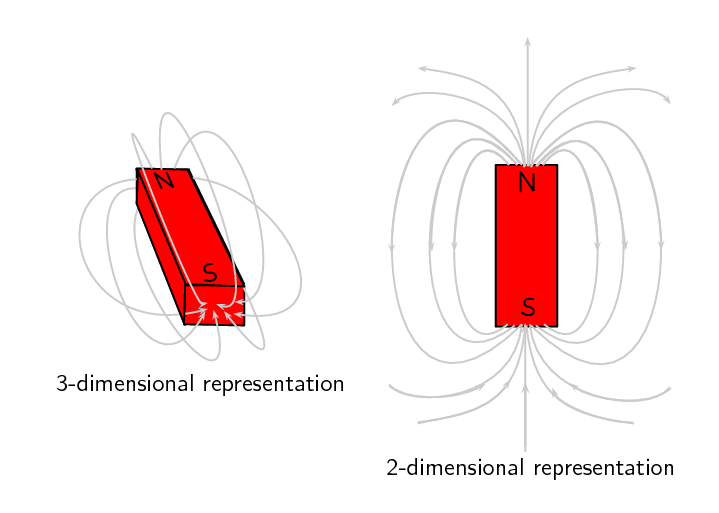 Although the magnetic field of a permanent magnet is everywhere surrounding the magnet (in all three dimensions), we draw only some of the field lines to represent the field (usually only a two-dimensional cross-section is shown in drawings). Arrows drawn on the field lines indicate the direction of the field. A magnetic field points from the north to the south pole of a magnet. In areas where the magnetic field is strong, the field lines are closer together. Where the field is weaker, the field lines are drawn further apart. The number of field lines drawn crossing a given two-dimensional surface is referred to as the magnetic flux. The magnetic flux is used as a measure of the strength of the magnetic field through that surface. Take a bar magnet and place it under a non-magnetic, thin flat surface (this is to stop the paper bending). Place a sheet of white paper on the surface over the bar magnet and sprinkle some iron filings onto the paper. Give the paper a shake to evenly distribute the iron filings. In your workbook, draw the bar magnet and the pattern formed by the iron filings. Draw the pattern formed when you rotate the bar magnet to a different angle as shown alongside. As the investigation shows, one can map the magnetic field of a magnet by placing it underneath a piece of paper and sprinkling iron filings on top. The iron filings line themselves up parallel to the magnetic field. Take two bar magnets and place them a short distance apart such that they are repelling each other. Place a sheet of white paper over the bar magnets and sprinkle some iron filings onto the paper. Give the paper a shake to evenly distribute the iron filings. In your workbook, draw both the bar magnets and the pattern formed by the iron filings. Repeat the procedure for two bar magnets attracting each other and draw what the pattern looks like for this situation. Make a note of the shape of the lines formed by the iron filings, as well as their size and their direction for both arrangements of the bar magnet. What does the pattern look like when you place both bar magnets side by side? As already stated, opposite poles of a magnet attract each other and bringing them together causes their magnetic field lines to converge (come together). Like poles of a magnet repel each other and bringing them together causes their magnetic field lines to diverge (bend out from each other). Ferromagnetism is a phenomenon shown by materials like iron, nickel or cobalt. These materials can form permanent magnets. They always magnetise so as to be attracted to a magnet, no matter which magnetic pole is brought toward the unmagnetised iron/nickel/cobalt. The ability of a ferromagnetic material to retain its magnetisation after an external field is removed is called its retentivity. Paramagnetic materials are materials like aluminium or platinum, which become magnetised in an external magnetic field in a similar way to ferromagnetic materials. However, they lose their magnetism when the external magnetic field is removed. Diamagnetism is shown by materials like copper or bismuth, which become magnetised in a magnetic field with a polarity opposite to the external magnetic field. Unlike iron, they are slightly repelled by a magnet.